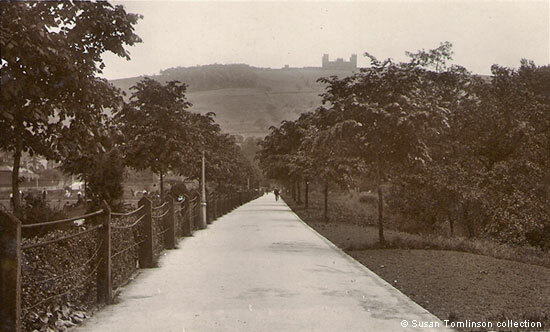 This postcard of the "Haw Lees" clearly shows the long line of fencing bordering the Broad Walk. The Council used railway sleepers for the uprights, through which they threaded the old tram cables. Glynn Waite points out that the tramway used 24 new cables during its lifetime and they had to go somewhere when they were replaced. In addition to the old cables being used on the Hall Leys they were also utilised along the Pic Tor Walk and remnants could be found there until relatively recently. Another recipient was Matlock Football Club. The drawback was that if you were at a football match on a hot day and leaned against the cable ropes you were likely to come away with a greasy line across your back. "Haw Lees and Riber Castle, Matlock". Copyright - Mat 13 [or 18?]. Lilywhite, Ltd, All British Photo Printers. Posted 20 July 1920. From conversations with Ken Smith. Waite, Glynn (2012) "The Matlock Cable Tramway", Pynot Publishing. ISBN 9780956270658.